We have so much to tell you about Lake Allatoona! 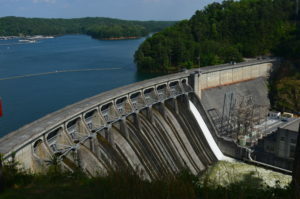 The U.S. Army Corps of Engineers began constructing Lake Allatoona in the 1940s. They maintain it today with excellence. Lake Allatoona is a beautiful recreational area close to Atlanta, Georgia. It’s the most popular lake in the state and among the most visited in the entire United States. Allatoona Lake is the first impoundment for water as it flows from the Blue Ridge Mountains. For an unparalleled view of the dam, we recommend stopping by the Allatoona Lake Management Office and Visitor Center. The Visitor Center features displays and video exhibits on the local area’s history, ranging from the time of early Indians, to the gold-mining and iron-making days, to today. Come and explore activities on Lake Allatoona, such as: fishing, boat rental, camping and hiking. Lodging is plentiful. Visit one of the lake’s many marinas, parks, local attractions and restaurants. You could spend an entire summer trying to see all the different sights … and still not hit them all.